This page is podcast version of online radio broadcasting hits in different genres (pop, rock, r&apos;n&apos;b/soul, country, jazz, dance and many more). 50% hottest tracks, 50% oldies. 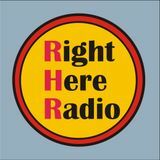 You can listen different Right Here Radio programmes here. Stay tuned!